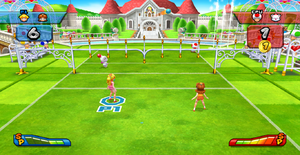 Peach's Castle is a court appearing in the game Mario Sports Mix. It is the home court of Princess Peach and takes place outside of her castle, presumably in the courtyard. The terrain of this area is grassy. The court can be played on all sports. The main feature of this court are the sprinklers and water fountains that occasionally squirt water. This can be either be a hindrance or of some help, depending on the situation. In dodgeball, there are three rows of sprinklers. Every so often, the sprinklers will go off and on, which can trap the players in a tight spot. There is also no dividing line on this court in dodgeball, meaning that players can be on the same side as their opponents. In hockey, there is a curve of sprinklers surrounding both goals. These fountains will go on and off occasionally. They can also be manually turned off by pressing the red or blue switch when it appears. In volleyball, the entire net is a giant row of sprinklers. If the ball hits one of the jets of water, it will bounce back into the players' side of the court. The water jets have an erratic pattern in volleyball though, so it may be difficult to get the ball over the net. Peach's Castle can be unlocked by winning a match while playing on this court in tournament mode of Mushroom Cup. For Basketball, however, the court has to be unlocked by either playing 30 Basketball game matches or by clearing a mission. In Harmony Hustle, Peach's Castle is one of the three courts that are used; the others being Bowser Jr. Blvd. and DK Dock. Peach's Castle and Toad Park are the only courts that do not have goalies when played in hockey. This page was last edited on March 28, 2018, at 17:50.